Spring MVC and AngularJs together make for a really productive and appealing frontend development stack for building form-intensive web applications. In this blog post, we will see how a form-intensive web app can be built using these technologies, and compare such approach with other available options. A fully functional and secured sample Spring MVC / AngularJs web app can be found in this GitHub repository. How does this compare with other approaches that use a full Java-based approach? The client is MVC-capable and contains all the presentation logic which is separated in a view layer, a controller layer, and a frontend services layer. After the initial application startup, only JSON data goes over the wire between client and server. How is the backend built? The backend of an enterprise frontend application can be built in a very natural and web-like way as a REST API. The same technology can be used to provide web services to third-party applications - obviating in many cases the need for a separate SOAP web services stack. 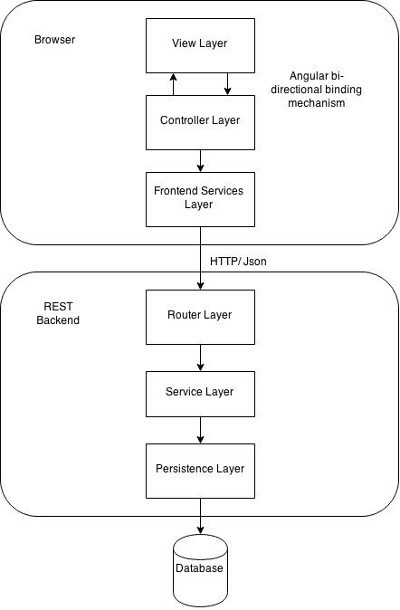 From a DDD perspective, the domain model remains on the backend, at the service and persistence layer level. Over the wire only DTOs go by, but not the domain model. One of the main responsibilities of the controller is to perform frontend validations. Any validations done on the frontend are for user convenience only - for example they are useful to immediately inform the user that a field is required. Any frontend validations need to be repeated in the backend at the service layer level due to security reasons, as the frontend validations can be easily bypassed. Let's see what other libraries we need to have the frontend up and running. a functional programming library to manipulate data. The one that seems the most used and better maintained and documented these days is lodash. a module system like requirejs is nice to have, but because the Angular module system does not handle file retrieval this introduces some duplication between the dependency declarations of requirejs and the angular modules. A CSRF Angular module, to prevent cross-site request forgery attacks. Spring MVC is currently best configured using only Java configuration. The web.xml is hardly ever needed, see here an example of a fully configured application using Java config only. The service and persistence layers are built using the usual DDD approach, so let's focus our attention on the Router Layer. The same Spring MVC annotations used to build a JSP/Thymeleaf application can also be used to build a REST API. If all the methods of the class are to be annotated with @ResponseBody, then it's better to annotate the whole class with @RestController instead. By adding the Jackson JSON library, the method return value will be directly converted to JSON without any further configuration. It's also possible to convert to XML or other formats, depending on the value of the Accept HTTP header specified by the client. See here an example of a couple of controllers with error handling configured. A REST API can be secured using Spring Security Java configuration. A good approach is to use form login with fallback to HTTP Basic authentication, and include some CSRF protection and the possibility to enforce that all backend methods are only accessible via HTTPS. This means the backend will propose the user a login form and assign a session cookie on successful login to browser clients, but it will still work well for non-browser clients by supporting a fallback to HTTP Basic where credentials are passed via the Authorization HTTP header. Following OWASP recommendations, the REST services can be made minimally stateless (the only server state is the session cookie used for authentication) to avoid having to send credentials over the wire for each request. This configuration covers the authentication aspect of security only, choosing an authorization strategy depends on the security requirements of the API. If you need a very fine-grained control on authorization then check if Spring Security ACLs could be a good fit for your use case. Let's now see how this approach of building web apps compares with other commonly used approaches. When the backend is running, no special tools or plugins are needed to achieve full frontend hot-deploy capability: just publish the resources to the server using your IDE (for example hitting Ctrl+F10 in IntelliJ) and refresh the browser page. The backend classes can still be reloaded using JRebel, but for the frontend nothing special is needed. Actually, the whole frontend can be built by mocking the backend using for example json-server. This would allow for different developers to build the frontend and the backend in parallel if needed. Productivity gains of full stack development? From my experience being able to edit the Html and CSS directly with no layers of indirection in-between helps to reduce mental overhead and keeps things simple. The edit-save-refresh development cycle is very fast and reliable and gives a huge productivity boost. In my experience, going full stack allows to implement complex frontend use cases in a fraction of the time than the equivalent full Java solution (days instead of weeks), so the productivity gain makes the learning curve definitely worth it. Spring MVC and Angular combined really open the door for a new way of building form-intensive web apps. The productivity gains that this approach allows make it an alternative worth looking into. The absence of any server state between requests (besides the authentication cookie) eliminates by design a whole category of bugs. For further details have a look at this sample application on github, and let us know your thoughts/questions on the comments bellow. If you enjoyed this article, we invite you to subscribe to the Angular University Newsletter (see box bellow).